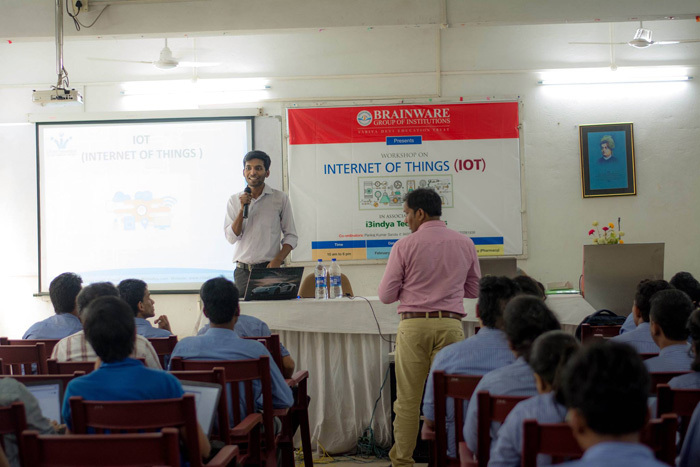 Conducted a workshop on “Internet of Things (IoT)” in association with i3indya Technologies, New Delhi for all B. Tech students on 22nd to 23rd February, 2018. Conducted a workshop on “Solar Power System Designing, Installation and Maintenance” in association with SOLAR-WARE, Kolkata for all B. Tech students on 6th to 18th July, 2017. Conducted a workshop on “VLSI DESIGN” in association with National institute for industrial training, Kolkata for all B. Tech students on 7th -8th September, 2017. Conducted ICETIC-International Conference in association with IEEE Advancing Technology for Humanity & ISRO for 4th year B. Tech students on 20th & 21st February, 2016. Conducted a workshop on “EMBEDDED SYSTEM AND ROBOTICS” in association with IBNC India & I-Medita for all 2nd, 3rd and 4th year B. Tech students on 7th -8th September, 2016. Conducted a seminar on “Current Trends in Industry for Electronics and Communication” in association with Ardent Computech PVT Ltd, Kolkata for all B. Tech students on 17th November,2016.